God Jul och Gott Nytt Ar! Come celebrate the holidays Swedish style at the Trim-A-Swedish-Christmas-Tree Party. The event takes place at the historic Swedish Cabin located at 9 Creek Road, Drexel Hill, PA 19026 on Sunday, December 2, 2018 from 2 PM until 4 PM. Admission is free but donations are always appreciated. The Friends of the Swedish Cabin invite you to attend a real special event of this holiday season. We will have Swedish holiday food, from their Julbord, beverages, decorations, and Swedish Christmas music! Help decorate the Christmas tree, Julgran, with apples, heart baskets and straw ornaments. Tour the cabin and warm yourself by a roaring fire. Toast marshmallows over the fire! And shop for gifts at our Butiken, too! It’s fun for all ages! Start your Christmas Season by stepping back in time with this very special event! Entrance is on Congress Ave.
Friends of the Swedish Cabin Welcome You! After some years of building up our organization, and through generous donations and volunteer work by members and friends of our non-profit group (FSC), we are excited to present this new web site in order to promote enthusiasm and share knowledge of this wonderful historic landmark. There is still lots of work to do! We will periodically post new information here, along with with information on how you can get involved in supporting the organization. 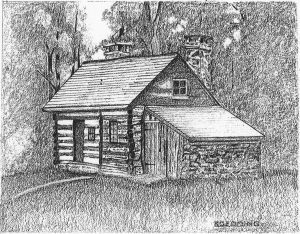 Friends of the Swedish Cabin is a non-profit group, created to conduct educational programs with an emphasis on history and natural science subjects, and shall have authority to engage in all activities which are consistent with this purpose, including the ownership of land and property with special concern for the restoration and preservation of this historic site and structure.